When new colleagues start working, there are certain things that always have to be done. The new employees will for example need some equipment, and the people responsible for arranging that needs to be informed. In the demos below Peter Kalmström, CEO and Systems Designer of kalmstrom.com Business Solutions, shows how to create two workflows that create tasks with information about new staff and the equipment they need. Peter uses three SharePoint lists for his workflow : a staff list, a task list and a settings list. In the first demo below, he only uses the two first lists. The process will be much enhanced if you also use a settings list for the equipment and responsibles. All lists should be on the same site. Peter shows that workflow in the second demo. 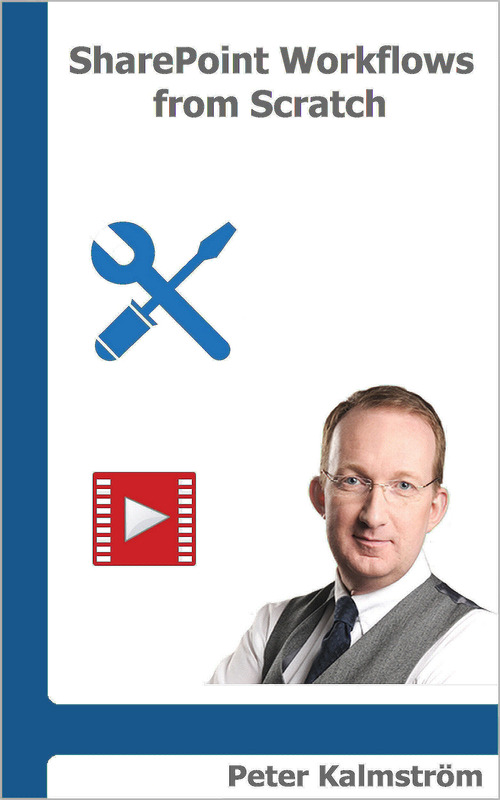 In this tutorial, which is primarily intended to show the use of a settings list, Peter has unfortunately over-simplified the so that people get equipment too early. Peter uses a SharePoint list called "Employments", which contains information about all staff and also about potential employees. We suggest that you instead use a separate list for staff only. Here we use the name "Staff" for that list. Then the workflow will work as it should: new people are not added to the list until they are actually hired, and that is when they should have their equipment. The workflows take information about the new employee from the Staff list, so that each new item's values for First name, Last name and Position (Management, Finance, Production) are used in the workflows. The second workflow also takes information from a Settings list: what equipment is needed and who is responsible for the task. In the first workflow, the equipment information and responsible hard-coded for each task. The equipment that should be given to each new employee varies depending on position. New staff in Management need a computer, a Visa card and a private office. In Finance, people will need a computer and a desk, and in Production they need a tablet and protection gear. In both workflows , create a list workflow connected to the Staff list and set it to start when an item is created. Test the workflow by adding a new item in the Staff list. Make sure that the appropriate equipment tasks for the new employee's position are added to the Tasks list. In this workflow each equipment item is written into the workflow, which means that you have to change the workflow every time there is a change in the equipment. The workflow is also affected when a responsible person changes, because the responsible person is set when the workflow's task action is created. Add a Condition for the Position value in the Staff list: if Current Item Position equals Management. Add the Action 'Assign a task' and select a responsible. At 'Task title', write in "Computer for" and add the dynamic values 'First name' and 'Last name'. Uncheck the box for 'Wait for task completion' if you want all tasks to be created in parallel. Copy the Action 'Assign a task' and paste it below that action, so that the Condition has two Actions. Copy both the Condition and the two Actions and paste it twice as two new Conditions with two Actions each. As Management has three equipment items, copy one of its Actions and paste it as a third action. Change the 'equals' values in the two pasted Conditions to 'Finance' and 'Production'. Change the written text "Computer" in the Actions into the other equipment items needed for the different positions. To further automate and enhance the process, we recommend that you let the workflow fetch data from a Settings list. With such a list, you avoid changes in the workflow each time the equipment is changed. Peter has renamed the 'Title' column to 'Position'. 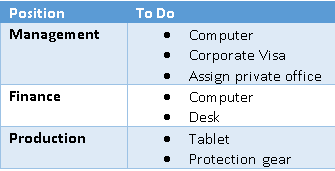 The equipment is separated into two lists: IT To Do and Backoffice To Do. Even if column values are changed in the Settings list, the workflow will continue working as before. When you use a settings list, the workflow may be more complicated to understand, but it is quicker to create. As users can make value changes in the SharePoint settings list without disturbing the workflow, this workflow is much more convenient to use in the long run. Create two Variables: IT ToDo and Backoffice ToDo. Set the Variable IT ToDo to the IT ToDo field in the Settings list. Copy the Variable stage, paste it below and change the values to Backoffice. Add an Action 'Assign a task' and select a responsible. At Task title, write in some general text and add the dynamic values 'First name' and 'Last name'. In the Description, add some general text and the variable IT ToDo. Copy the Action and change the variable into Backoffice ToDo. In this example Peter only makes the equipment editable in the settings list. In a more detailed example he could also have made the actual persons responsible editable. If you want to do that, let the workflow pick the responsible from the settings list instead of hard-coding it when you start building the 'Assign a task' action.